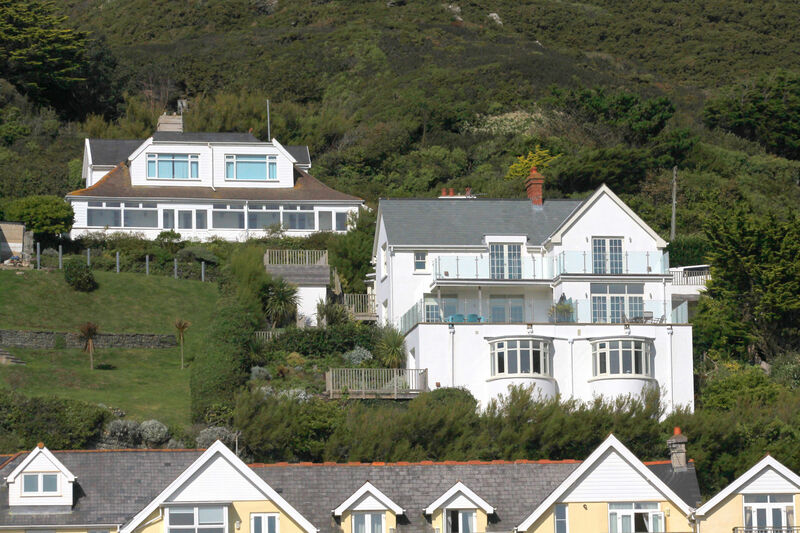 2 Gull Rock Has Wonderful Sea Views Along The Beautiful Woolacombe Beaches Enjoyed From Its Very Large Terrace. The Apartment Offers Spacious 2 Bedroom Accommodation With Master En-Suite Having French Doors To A Further Patio. 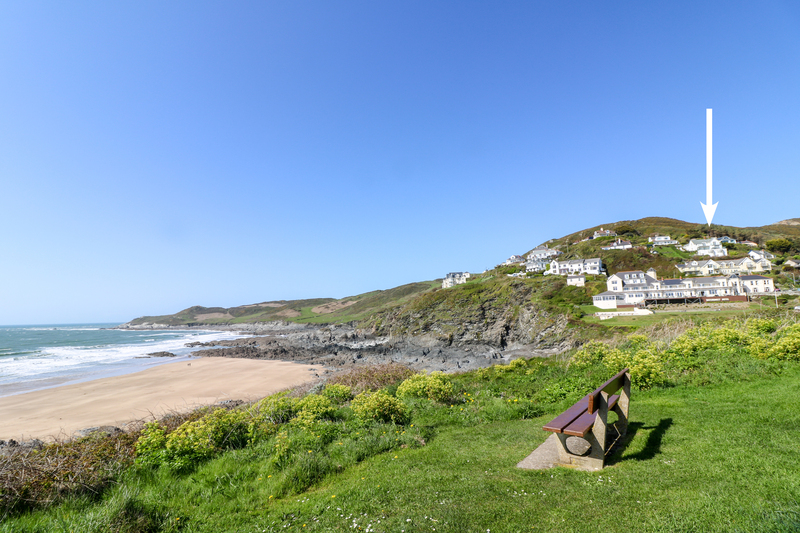 This property has an extremely large decked terrace, with some of the best views of the beautiful Woolacombe beach, coastline and out to Lundy Island! 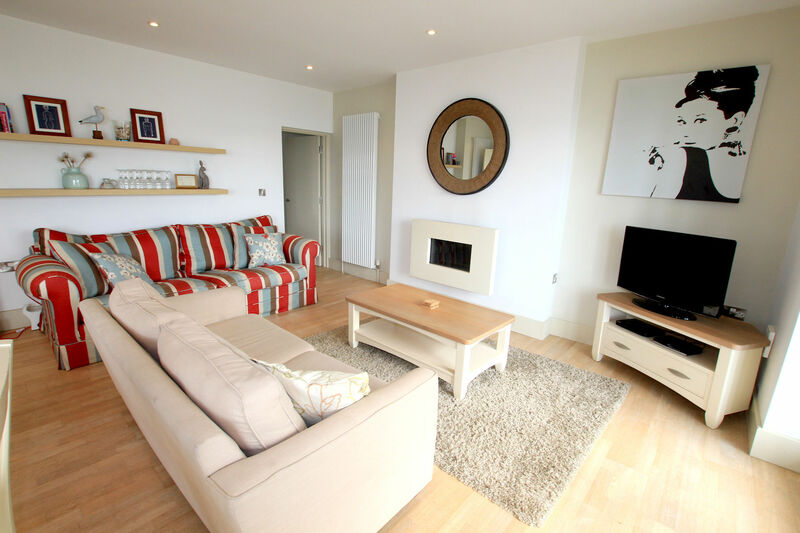 This spacious two bedroom apartment is situated above Combesgate Beach and just a ten minute walk of the main 3 mile sandy/surfing beach of Woolacombe and offers accommodation for 4 people. 2 Gull Rock offers open plan kitchen/dining/kitchen with two sets of French doors leading out onto the lovely decked balcony which makes the most of this wonderful position. The kitchen is well fitted with corian work surfaces, dishwasher, washing machine, large fridge/freezer, electric oven and gas hob. The master bedroom has French doors opening out onto an attractive paved side terrace, enjoying expansive sea views. There is a contemporary en-suite shower room. The family bathroom is well fitted with shower over the bath and there is a second bedroom with twin beds which also serves as a super king, with super king duvet etc. There are fitted wardrobes to both bedrooms. The Gull Rock building sits on the hillside and the parking for one vehicle (not suitable for large vehicles as parking is very tight, especially in peak season) is positioned at the top. Steps lead down to the first floor apartment and onto the side terrace which is solely for the use of this Apartment with no further access to other apartments. The side terrace has a picnic bench and BBQ (only to be used on the side terrace and not the decked balcony). The large decked balcony which is accessed from the main living/dining/kitchen is equipped with table and chairs for outside dining. In view of the steps leading down to the apartment the property is not suitable for restricted mobility. Should more than one vehicle need to be accommodated there is no additional parking close by and vehicles would need to be parked in Mortehoe where there is a village car park (approx. 0.5 miles / 10 minute walk). THERE IS NO MICROWAVE AT THIS PROPERTY. This property does not have Wi-Fi. There is a BT Open zone service, please visit www.btwifi.co.uk for full details. The Gull Rock building has a lower ground level to the front of the building (closest to the sea), than the rear. The car park is situated at the rear of the property above the level of the apartment, with external stairs leading to the front door of Apartment 2 Gull Rock. The terrace and balcony (as seen in the photographs) is on the same level as the apartment. Please note that there is another apartment beneath. PARKING FOR THE GULL ROCK APARTMENTS IS TIGHT AND ONLY SUITABLE FOR SMALLER VEHICLES WHEN MORE THAN ONE APARTMENT IS IN USE. 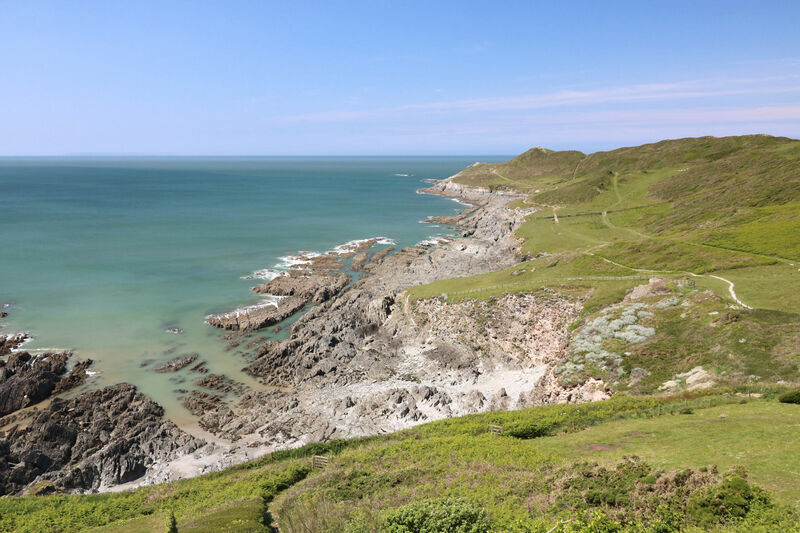 There are some wonderful walks to be enjoyed very close by on the coast path through the National Trust ground at Morte Point, up to Mortehoe and of course along the beautiful sandy beaches towards Putsborough. 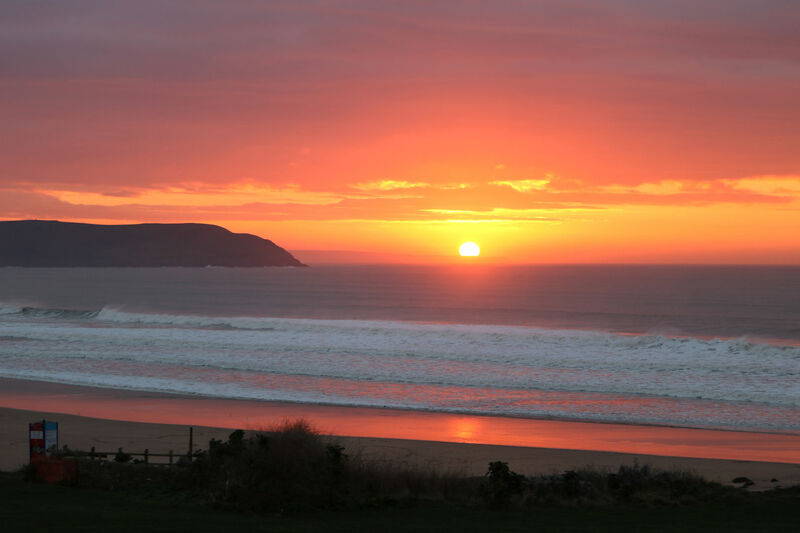 Barricane Beach is a hidden shell beach towards Woolacombe, which has a cafe which towards the end of the week, serves wonderful authentic Sri Lankan curries ... watching the sunset sitting on the beach with a bottle of wine and enjoying a fine curry is a great experience! We regret that this property no longer accepts pets. Stunning location ! Views are amazing ! Great family/dog friendly apartment. Excellent in all weathers, particularly for dog walkers and people who love the coastal walks. Exmoor National park on the door step . Beach down the road. Fantastic takeaway in Mortehoe. Going back December! Twin Bedroom Configuration - Can be arranged as either two single beds or a super king bed.